What was your food moment? You know, that moment when you realized that all food was not created equal. Perhaps it was when you discovered that seasonal foods simply tasted better. Or, perhaps it was when you found out that by supporting local family farmers you would support your community. Everyone has their "moment." For me, it happened in 1998 when I found myself on the streets of Madison, Wisconsin saying, "Want to sign a petition to preserve the organic standards?" I was a student of agriculture at the university and I'd just discovered that the food that I had been eating my entire Midwestern life wasn't the healthiest. I had walked into the Williamson Street Co-op and after reading the labels and being surrounded by organic foods, I decided to make the switch. At the same time the USDA was threatening to lower the organic standards as they formed the National Organic Program (NOP), and a call to action to preserve the integrity of organic by the Center for Food Safety got me out and into the streets. The Center for Food Safety won on many fronts, but since the NOP's inception, consumer watchdog groups have had to continue their diligence to ensure that our food that is labelled as organic, remains as unadulterated as possible. Meaning without pesticides, synthetics, GMOs or other allowances that most people would agree are not "organic." So I couldn't help but feel a flutter of excitement when I heard the call for action this week, to once again get out there and collect physical, real-world signatures! This time, to get GMOs labelled. Labeling GMOs moves us in a proactive direction that will let each of us decide whether or not we want to eat them. Most other countries have chosen to label them, and all of us in support of labeling feel that it is our right to know. (Check out this video to see how many other countries have implemented labeling.) Where the attempt to banning GMOs in the early part of 2000 was only marginally successful, this effort has the potential to dramatically level the playing field. 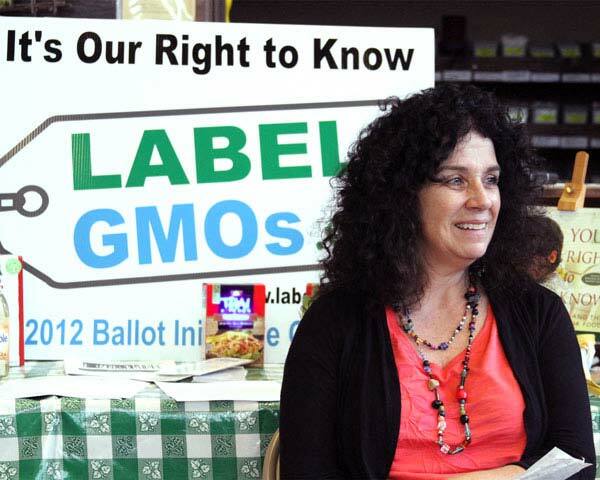 The California Right to Know Genetically Engineered Food Act of 2012 will undoubtedly make it on the ballot this year and is a call to action for Californians that don't want to expose their families, or themselves, to the adverse health impacts of GMOs. While the Act needs hundreds of thousands of signatures to make it on the November ballot, I have no doubt that this will happen. Right now dedicated volunteers are out there collecting signature! And the woman behind the charge? Pamm Larry. There is a growing body of scientific research that indicates genetically engineered crops put our health at tremendous risk. "'Transgenic' seeds reduce the use of some insecticides," says Doug Gurian-Sherman, a plant pathologist and senior scientist at the Union of Concerned Scientists. "But herbicide use is higher, and respected experts argue that some genetically engineered crops may also pose serious health and environmental risks. The benefits of genetically engineered crops may be overstated." Jeffrey Smith, consumer advocate and director of the Institute for Responsible Technology, says that FDA scientists had repeatedly warned that GM foods can create unpredictable, hard-to-detect side effects, including allergies, toxins, new diseases, and nutritional problems. "They urged long-term safety studies, but were ignored," claims Smith. Recent polls show that 9 out of 10 Americans want GMO foods to be labeled. Sometimes all it takes is the volatile vociferous voice of an Italian granny from Chico, California to have her Samuel L. Jackson "Snakes on a plane" moment, and bravely cry out, "ENOUGH IS ENOUGH!" Pamm Larry, farmer, midwife, businesswoman and a gutsy grandmother of three was so distraught about our modern day food system that she quit her day job and spent her time educating herself on GMOs and how to apply for a ballot initiative. Next, she searched out her team and went straight to the state capital to painstakingly navigate through the bureaucratic muddle of tedious paperwork necessary to put an initiative on the California ballot. On Feb. 18, 2012, California voters will be able to sign a petition to place this highly charged issue on the ballot. 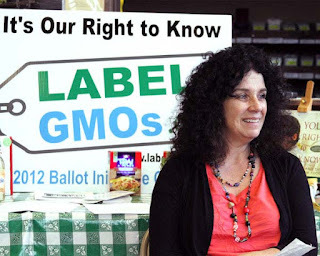 Once 560,000 signatures are collected between February and April, 2012, this measure goes mainstream and onto the November ballot in the form of the California Right to Know Genetically Engineered Food Act. I spoke with Pamm Larry a week before the signature gathering period begins. You are the original instigator and the Northern California organizer of the Label GMOs campaign. What made you courageous enough to take on Monsanto and the other biotechnology companies? I don't feel like I'm taking on Monsanto or the others. I'm simply taking a strong stand for our right to know what's in our food. I woke up to the knowing that it was time for me to do more than whine and be depressed about our food situation. I've since come to believe that I'm so glad I let go of the belief that it was someone else's job to get this done. If I care, it's mine. It's been a quite the eye opener. Had you been politically active in the past, and how painful was the application process for a ballot initiative? I've always been politically aware, but this it the first time I've done any organizing. The actual paperwork of forming the committee was easy. The part about writing it was an amazing process to witness... and I need to be infinitely clear that I did not write this. Lawyers, politicians, scientists, processors, farmers all came together. No one, least of all me, would have wanted me to write this. It was a labor of love that these folks devoted themselves to and I am so grateful to them! Who came on board next to help? The Organic Consumers Association (www.OCA.com) came on board. Ronnie Cummins, Alexis Baden-Mayer and the rest of the team were right there from the beginning and have continued to be a driving force for truth telling in the organic industry and keeping the grassroots strong. I admire them immensely. Jeffrey Smith and the Institute for Responsible Technology www.responsibletechnology.org) helped out at a crucial point in our grassroots building. Because they were willing to put out the word to their members to help me get meetings in communities, labelgmos.org (www.labelgmos.org), the original grassroots effort, grew exponentially in a very short time. I commend Stacey Hall, who helped organize and support the leaders in the south, and the over 100 leaders around the state who believed in this long before anyone else did. They are volunteering 20-40 hours a week to see this gets on the ballot and then voted on come November. Then there's another hero; our webmaster, who has created an amazing site on no budget to speak of. Are you surprised by how many Americans don't know what a GMO is? Yes. I believe it's been a very well orchestrated program of silence. I've been an avid organic fan for decades and I hadn't even heard about GMO's until about 8 years ago. I find many in the same place. Amazing to me, especially since it's a huge subject once you start down the rabbit hole. How can we best educate the public on this issue? I believe this will be won on the streets, one by one, with us talking to our communities, looking in each others eyes. That's how it began. We need to talk about it with each other. We need to spread the word and invite folks to learn more- read articles, watch films. We've got to wake up to what's happening to our food supply and take back our food sovereignty. I recently learned that the California Medical Association has a resolution in support of labeling Genetically Engineered foods. If the doctors think it a good idea... well... that's sure something, yes? What do we need to have this initiative pass? First we need to get it on the ballot. That requires 560,000 qualifying signatures. We have the services of a signature gathering professional to lead that drive and all are confident that we'll get there. Please visit www.labelgmos.org and volunteer to help us gather signatures. Come to a one hour training workshop and then hit the streets with your neighbors! Then we need to educate folks about the issue. They have a right to know that they are innocently and blindly feeding their children; foods developed, then grown, via a genetically engineered process that has not had any long term testing on humans and that has increased the use of pesticides and herbicides. Which companies are backing the labeling campaign? David Bronner, of Dr. Bronner's Magical Soaps (www.drbronner.com) decided to get involved. His passion and commitment just blows me away. He is the reason large companies and the various NGO's finally decided to give this a second look. Without him, this initiative would not be where it is today. Because of him, the Center For Food Safety (www.centerforfoodsafety.org) became involved in writing the initiative. The folks who wrote the actual law did an incredible job. Food Democracy Now (Fooddemocracynow.org) brought its expertise in grassroots support of farmers. Mercola.com, Nature's Path, Lundberg Farms have all invested time and financial support in moving this initiative forward. Straus Dairy has been amazingly supportive in many ways. (One of which is hooking us up with their rocking ice cream whenever we ask!!) And now our coalition is growing to include other endorsers and supporters of varying involvement. Frey Vineyards, Nutiva, Guayaki, Amy's, Organic Pastures and UNFI have also been supportive. There are others you can find on Labelgmos.org. What will be the talking points of the opposition? 1. "We have been doing this for thousands of years." Answer: NOT true. This is not about hybrids or selective breeding. The initiative is clear in its definition of what a genetically engineered food is. It is where they take the DNA or RNA of one animal, plant, yeast, etc, and put it in another animal, plant, yeast, etc. It cannot happen in nature. For instance, in nature, a fish and a tomato do not breed and reproduce a new entity. 2. "What about feeding the world?" Answer: First off genetically engineered foods are not feeding the world. There are books on the subject. The UN and the University of Davis both came out with studies last year stating that the way to feed the world is NOT via corporate monoculture agribusiness; it's through agroecology (the application of ecological principles in farming). But even though the 'feeding the world' thing is a great PR myth, at the end of the day, what does feeding starving children in Africa have to do with labeling GE foods in California? Nothing. It's a different subject that's used to confuse people. 3. "Food costs will go up." Answer: NOT true. Companies change their labels all the time. There is a phase in period where all companies could easily incorporate this change into the design, too. Did everyone notice a jump in prices when they started labeling trans fats? No. Same thing here. There is no cost to the state. To say otherwise is a blatant diversion and misrepresentation or the person has not read the language of the law. 4. "The government (FDA) says we don't need labeling of GMOS because they are the same as non GMO." Answer- NOT TRUE. They are using 14th century science with that policy: if it looks the same and (in general) smells the same, it must be the same. We are asking the FDA to use 21st Century science. What have you learned from this that you can pass on to other citizens wanting to get a measure on a state ballot? Just start. I've learned that if we wait for someone else to do it, it won't get done. I had no idea where this would end up. I still don't. If I had waited for funding to start, this would not exist. If I waited for others to agree with me, I would have stopped after a month. While I believe "experts" and "professionals" are vital to everything in life, if I had listened to them carte blanche, this initiative would not be where it is today. I simply "knew" this was right, knew I could not stop, and kept on going. I let go of the outcome and continue to, knowing that I've done all I could to make it happen. The rest isn't up to me. I believe this is happening because it's time. It simply needed a tenacious, focused spark and a commitment to keep on going no matter what. Fundraising. How much is needed and where can "people who like to eat" send donations? The coalition is gearing up for a very large sum as initiatives are very expensive. You can donate to the coalition effort at http://www.carighttoknow.org. Labelgmos.org will continue to raise monies independently as the original grassroots effort and member of that coalition. Our primary need for funds is for printed materials and film rights to educate the public about GMOs. You can donate on our site at www.labelgmos.org.